Every year during the holiday season, I look for new music to add to my holiday music collection. We only get to enjoy this music for a short time and then it is time to put it away until the next year. 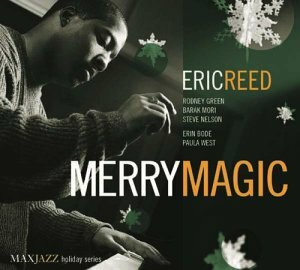 This season I am enjoying the second release in the MAXJAZZ Holiday Series: Merry Magic by Eric Reed. Eric brings fresh new approaches to these holiday classics and swings hard on piano on such favorites as “God Rest Ye, Merry Gentlemen” which features Steve Nelson on vibes and “Winter Wonderland.” He sings excellently on “Santa Claus is Coming to Town” and contributes his own swinging composition “Angels in the Snow” which includes Barak Mori walking the bass and Rodney Green keeping time on the drums. Eric is also joined by upcoming MAXJAZZ vocalist Erin Bode on wonderful renditions of “I Wonder As I Wander” and “What Are You Doing New Year’s Eve?” Popular jazz and cabaret singer Paula West sings a playful rendition of “Santa Baby” and the reflective “After The Holidays.” His early roots of playing gospel music in his father’s storefont Baptist church are evident on “Lo, How A Rose E’er Blooming” and “The Christmas Blues” which features Eric on solo piano and “Oh Come All Ye Faithful (Adeste Fidelis)” with him on organ. “The Christmas Song” has a bit of a breezy and tropical feel but is very solid. Merry Magic will definitely make your spirits bright this holiday season and for years to come. Enjoy your music. This entry was posted on Tuesday, December 9th, 2003 at 4:07 am. It is filed under Music Reviews and tagged with Christmas, Eric Reed, Merry Magic. You can follow any responses to this entry through the RSS 2.0 feed. I bought the Fourplay “Snowbound”. I know it’s not a new release, but it’s a good one. I also try and get at least one new holiday disc every year. Oops! I listened to the samples at Amazon. THere you go again, making me spend money. Ha.. got you this time… I added it to my Amazon wish list… hahahahah. Here’s a review request Ruben Studdard’s “Soulful”.